Tah dah! Drum roll and bugle blast please! 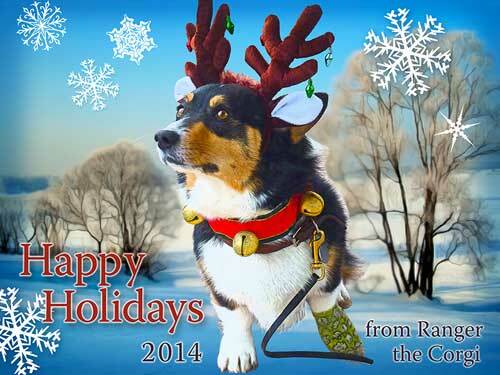 Holiday cards 2014! The first is best because there’s a Kincaid painting in the background. When you see those cozy cottages it makes a corgi wonder how nice it might be to lie by the fire, drink cocoa, eat desiccated liver, and have a belly rub. There’s cocoa in that cottage for sure! That version (above) wasn’t so great. But we had a photo of some Christmas lights lying around, so what the hey. Then there was this image (above), we used a public domain snow scene. We can work with that, right! Not bad. Two paws up! To make these holiday cards my human did something she calls “photoshopping.” She transformed the gray sidewalk of reality into a winter wonderland, not once, but three different times for the holiday cards. Want to see the original photo, from the sidewalk near Companion Animal Hospital? I knew you would. It was a very savory location that all the canines had carefully marked. 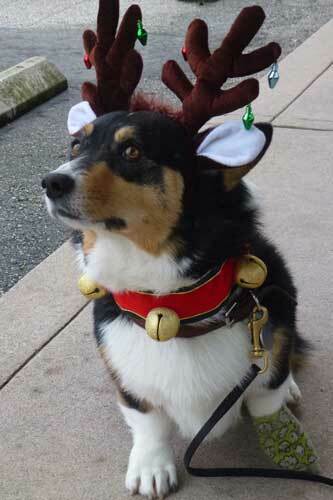 First I just wasn’t in the holiday spirit. What I endure for my human’s whims! Then I saw how much attention I was getting and there was the scent of holiday dog biscuits in the winter air! Ranger gets some loving, and gives some back, at Project Purr. Okay, so all this decorating and fussing about pictures was lots of fun, for the human. However I enjoyed a more reflective and socially responsible moment when I visited Project Purr. (see photo of me reclining, above) They help rescue cats. http://www.projectpurr.org/index.html I’m in favor of that. Rescue them and then chase them, good plan. Here I am doing some corgi therapy at Project Purr, in their Rescued Treasures shop. 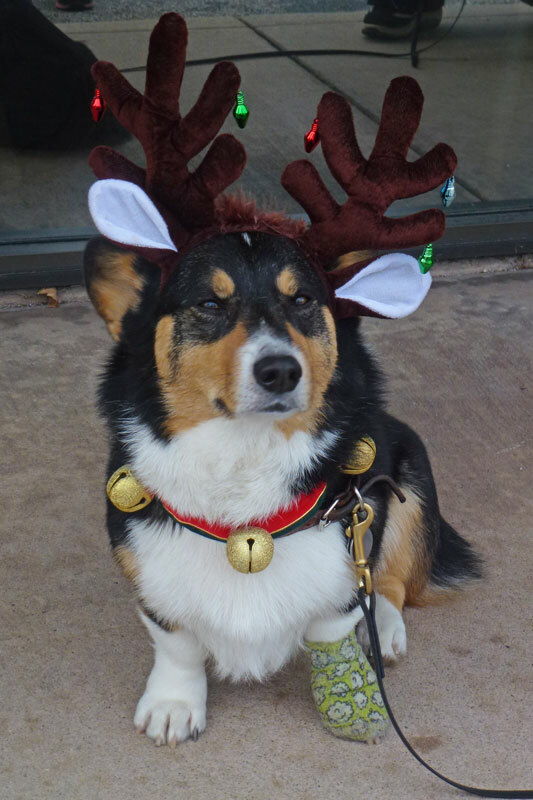 I hope that lady liked her corgi therapy as much as I did, “a little to the left and get that spot under my chin, ahh, that’s it!” says Ranger. I haven’t written in so long that I afraid I’ll wear you guys out trying to show you everything…however, because I’ve been to the vet recently we’ll go from the “Holidays” to the “Paw Maladies.” I had a mass in my foot…not a Christmas Mass, a lump. It was removed by a highly skilled surgeon and staff. It was a big deal, because I am a big deal. 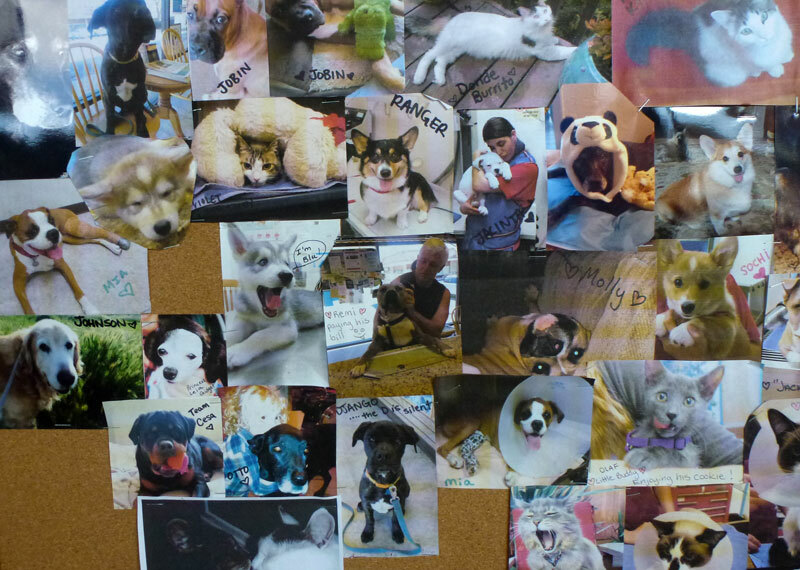 When I was at the vet’s office I saw a cork board with lot’s of dog pictures on it. Cork board at the vet’s office. Wait a minute? Is that I picture of me? 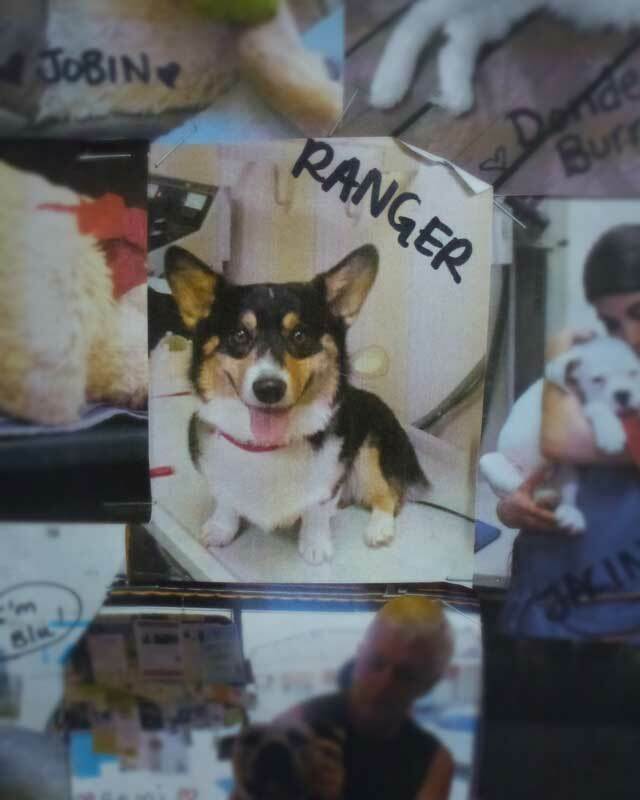 Forget Waldo, where’s Ranger? Cool, look at all those faces! Now wait a minute! I’m in there. Can you find me? Well see the picture below, there I am! This was taken while I was having fun at the vet. I was smiling a lot to let them know I was a really good friend and that they shouldn’t hurt me or spare any biscuits in pampering me. I’m hoping to get to some real snow sometime soon, now that the Sierras actually have snow. 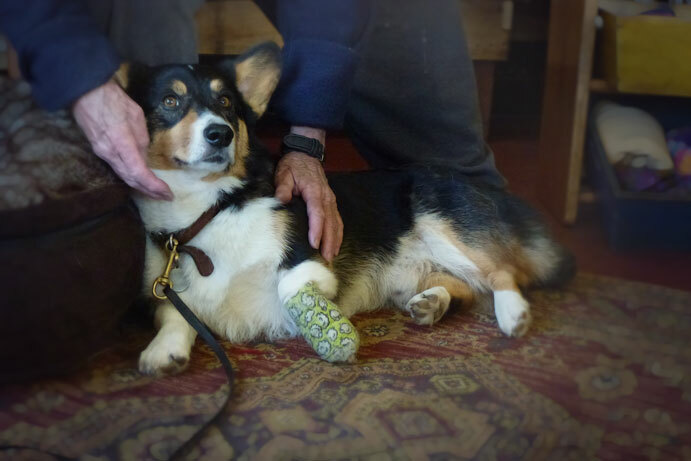 My paw is still healing, so my humans might have to buy me some little winter boots, lined with soft fur. Then the Queen and Pappy Snack Pockets can bundle me up in a wool coat and pull me around on a toboggan loaded with dog treats. That would work. So that’s it, the end of 2014. It was a weird year. High points: 1. Rolling in a very smelly cheesy substance over at Luna’s yard…it made my humans gag. It was that good! 2. Going to the Puppy Breath Boutique and chowing down on desiccated lung! 3. Getting my herding HT title to add to my herding PT title. 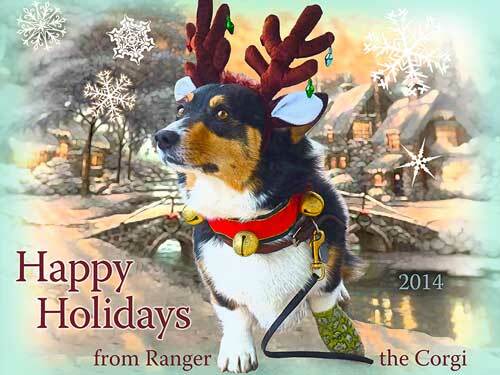 So now I’m Ranger the Corgi, HT, PT. I’m qualified for sheep herding. Now where are those sheep! No sheep in the suburbs. This is a problem for me…but, I digress. Low points: my horse died so I don’t have one anymore. My paw hurt and had to have surgery. Well, it wasn’t an easy year…but I try to stay “on the good foot” at least until the other one heals. I hold good thoughts and images for 2015. I hope it is filled with happiness, sheep and biscuits for all of you! 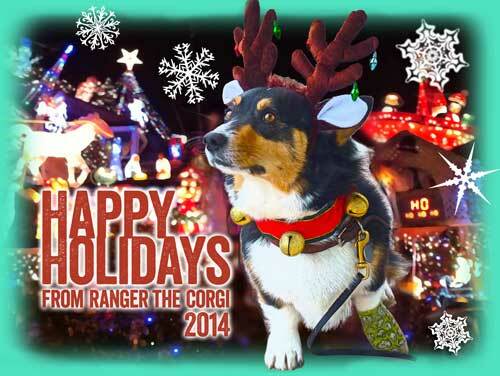 This entry was posted in Uncategorized and tagged corgi in costume, holiday corgi, humor corgi, Ranger the Corgi, winter corgi. Curious observations by a Corgi living on the California coast.